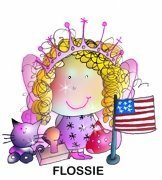 Here is a collection of 4 thank you cards that can be packaged together in a gift box. Since they are all just straight cuts, they come together very quickly. The thinner strip of patterned paper is 1 3/4" wide, and the one covering most of the card base is 4 1/4" - so you can get one thin strip and one card base from each 6"x6" piece of paper. Lots of cards from one paper pack! 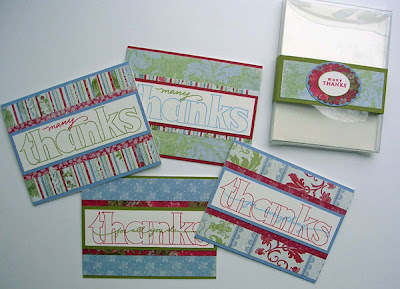 I really like this stamp set (Mega Thanks) because it is so quick and easy to use. It has the big thanks plus some script additions. There is also a Mega Happy - which I have not had time to play with yet. The cards above were made with the Denim and Lace card kit. 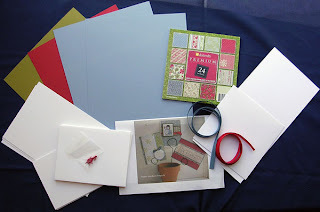 It includes the patterned paper pack, cardstock, cards, envelopes, brads and ribbon. I just love these colors together. Thanks for stopping by - and remember only one more day to enter the drawing for the card kit on this post. These cards are great, love the paper. Great cards, Cathrine! Love that kit! this is so great love that you even decorated the box! fabulous! Well, I am hooked again. Good thing today is payday, lol! I am off to buy that mega Thanks stamp set- LOVE what you did with them!